Azure Stack, the turnkey hybrid cloud system that you can now order from server vendors like Dell EMC and Hewlett Packard Enterprise or get as a managed service from providers like Avanade on hardware in your own data center, is intended to be concrete proof of Microsoft’s view that cloud is an operating model and not a place. It’s obviously designed to let you integrate private and public cloud services – but how well will it fit into your existing infrastructure? What it gives you is a system that’s not exactly the same as Azure running in an Azure data center but that’s consistent with it, using the same management API and portal, with many of the same services, giving you a unified development model. Think of it as a region in Azure. 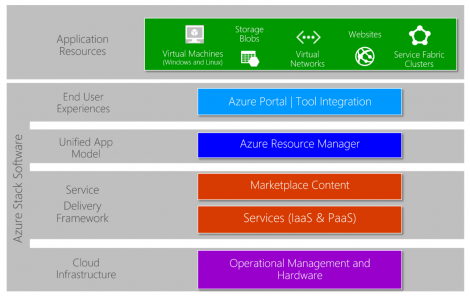 Not all Azure regions have exactly the same services available, but they all get the core services, ranging from storage, IaaS, and Azure Resource Manager to Key Vault, with Azure Container Service and Server Fabric coming to Azure Stack next year. Some public Azure services may never make it to Azure Stack, because some things only make sense at hyper-scale. You can use Azure Stack to run cloud workloads that you don’t want in the public cloud for compliance reasons – the most common consideration when businesses weigh cloud services. That includes both the Azure services and third-party PaaS and IaaS workloads, such as Cloud Foundry, Kubernetes, Docker Swarm, Mesosphere DC/OS, and open source stacks like WordPress and LAMP, which come as services from the Azure Marketplace rather than bits you download, install, and configure manually. Just as interesting is the ability to use cloud tools and development patterns without the latency of an internet connection – whether you have poor connectivity (on oil rigs and cruise ships, in mines, and other challenging locations) or need to process sensor data in near-real-time. The hybrid option is going to be the most powerful. You can use Azure services like IoT Event Hubs and Cognitive Services APIs with serverless Functions and Azure Stack to build an AI-powered system that can recognize authorized workers and unauthorized visitors on your construction site and warn you when someone who’s not certified is trying to use dangerous machinery. Microsoft and Swedish industrial manufacturer Sandvik showed a prototype of that at the Build conference this year. That’s the kind of system you’d usually choose to build on a cloud platform, because setting up IoT data ingestion, data-lake, and machine learning systems you’d need before you could even start writing code would be a complex and challenging project. With Azure Stack, developers can write hybrid applications that integrate with services in the public Azure cloud that can be a first step in an eventual migration (if the issue is data residency and a cloud data center opens in the right geography), or to augment a system you never plan to put in the public cloud, and have the same DevOps process covering both environments. You can also use Azure Stack to run existing applications, especially if you want to start containerizing and modernizing them to move from monolithic apps to microservices. “You can connect to existing resources in your data center, such as SQL or other databases via the network gateway that is included in Azure Stack,” Natalia Mackevicius, director of Azure infrastructure management solutions, explained in an interview with Data Center Knowledge. But even if you’re using Azure Stack to virtualize existing applications, you’re going to be managing it in a very different way from your existing data center infrastructure – even if that includes Microsoft’s current Azure Pack way of offering cloud-style services on premises. Azure Stack does integrate with your existing tools. When you set it up, you can choose whether to manage access using Azure Active Directory in a hybrid cloud situation, or Active Directory Federation Services if it’s not going to be connect to the public cloud. But you never do most of the setup you would with most servers. Network configuration happens automatically when you connect the switches in Azure Stack to your network, for example. “Customers complete a spreadsheet with relevant information for integration into their environment with information, such as the IP space to be used and DNS. When Azure Stack is deployed, the deployment automation utilizes this information to configure Azure Stack to connect into the customer’s network,” Mackevicius said. You won’t monitor Azure Stack like a normal server cluster because much of what an admin would normally do is automated and taken care of by the Infrastructure system. But there are REST APIs for monitoring and diagnostics – as well a System Center Operations Manager management pack for Azure Stack and a Nagios extension – so you can use your usual monitoring tools. Server vendors like HPE are using those APIs to integrate Azure Stack into their own tools, so if you already use HPE OneView, for example, you can manage Azure Stack compute, storage, and networking through that. For backup and DR, you need to think both about tenant workloads and the infrastructure for Azure Stack itself. Microsoft suggests Azure Backup and Azure Site Recovery for replication and failover, but that’s not the only option. “Tenant assets can use existing backup and DR tools such as Veeam, Commvault, Veritas Backup products,” or whatever other systems you already have in place. “For [its own] infrastructure, Azure Stack includes a capability which takes a periodic snap of the relevant data and places it on an externally configurable file share,” Mackevicius explained. That stores metadata like subscription and tenant-to-host mapping. so you can recover after a major failure, and you can use regions within your Stack deployment for scale and geo-redundancy. Updating is also very different. Updates to the Azure services and capabilities will come whenever they’re ready; updates for the Azure Stack infrastructure will come regularly, but that’s updates to infrastructure management. Even though Azure Stack runs on Windows Server, you’re not going to sit there testing and applying server patches. What Microsoft calls ‘pre-validated’ updates are delivered automatically, and what you control is when they’re applied, so they happen during your chosen maintenance window. Azure Stack gives you the option of taking advantage of that cloud value without having to give up the value you get from your own data centers, but you will be doing things differently.